Total Mail Converter Pro converts MSG and EML files to HTM, TXT, PDF, DOC, JPEG. The Pro version converts email attachments as well. This is the best way to save your emails in popular formats to refer to them later. Download the free trial copy now. 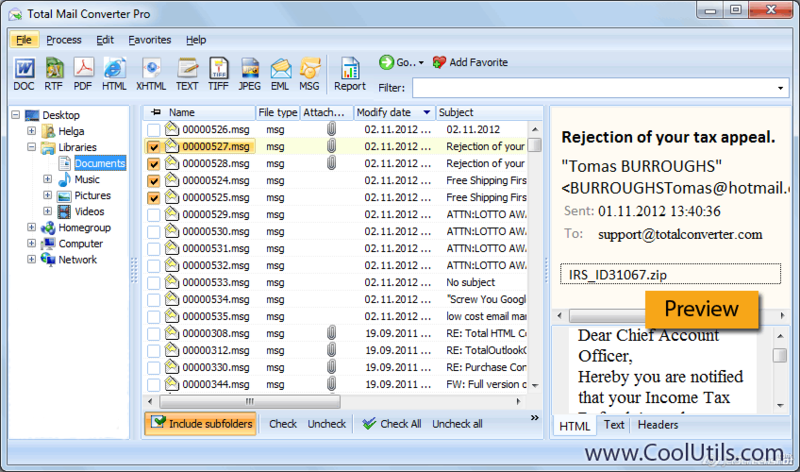 Total Mail Converter Pro converts MSG and EML files to HTM, TXT, PDF, DOC, JPEG in batch. The Pro version converts email attachments as well. This is the best way to save your emails in popular formats to refer to them later. Total Mail Converter Pro allows tuning the output file using any external scheme. The interface has built-in wizard to help you make all the settings. Download the free trial copy now and convert emails in 3 clicks. Expired Cookies Cleaner is a freeware utility for removing unused cookies from your computer. It will clean Internet Explorer`s cookie files that will be never used. This tool helps you to save your disk space by removing unused files. Free Wake-on-LAN utility with UI, designed to wake up multiple PCs at once and work in large corporate networks that may include multiple subnets. The application has a feature to detect MAC addresses of remote PCs that allows to automate WOL tasks. Lets you easily save Flash movies from Internet Explorer (and any IE based browser) . Adds a button to the Internet Explorer toolbar to easily save Flash movies from the web page being viewed. Can save all Flash movies on the web page. The all new version of Wipe It Off- Internet History Eraser - Free Edition comes with tons of new features and benfits. New web page sections like Interactive User Forums, helps you answer a lot of your online privacy issues. XFilemirror is a file mirroring solution by Sibsoft which will able you to start your own file mirroring service. Uploaded files will be automatically distributed to several file sharing sites.